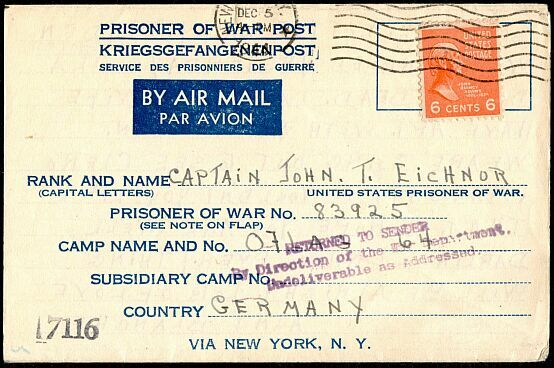 A six-cent air mail rate was established for letters sent to United States prisoners of war and other detainees held in enemy, enemy occupied or neutral countries from March 13, 1944 through September 30, 1946. This rate was extended to all Allied prisoners of war and the like on September 23, 1944. On December 14, 1944 a specific type of letter sheet could be sent to prisoners of war, United States or Allied, by air without charge. The six-cent rate remained in effect for mail not using such forms. The letter shown above is on such a form, but was sent on December 5, 1944, before the free rate. It was returned as undeliverable, reaching New York on July 26, 1945.